Calder was established in 1135 by Ranulf de Gernon, earl of Chester, and is the third house in the county which owes its origin to this famous family. (1) The house was colonised by monks from the Savigniac house of Furness but was the victim of the Scottish military campaigns in the north of England, following the death of Henry I in 1135. The desolate monks sought refuge at Furness but were refused entry. Eventually the monks of Calder, under the protection of Thurstan, archbishop of York, were settled at Byland. The house was suppressed along with all the lesser monasteries in 1536, with a clear annual income just over £50, and a community of nine monks. (4) At the time of the Dissolution, the house was acquired by the royal commissioner, Thomas Leigh, and parts of the house were adapted for occupation. 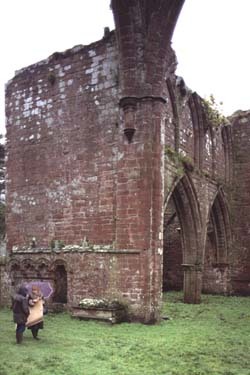 (5) The remains include part of the tower, now some 64 ft high, and the west doorway, with some of the chancel and transept; they are, however, unsafe and have to be viewed from the road or footpath. The ruins stand in the grounds of an eighteenth-century private house, and may be visited by prior arrangement with the owner.